Joan Peters’ book, published in 1984 and 7 years in the making, began as a sympathetic investigation into the reasons why the Palestinians have remained refugees since the Israeli War of Independence in 1948. It soon became apparent, that there was much beneath the surface that simply did not add up. Her research was not straightforward, but rather like discovering pieces of a jigsaw puzzle, which had been discarded or put aside, leaving great gaps in the whole. When researching the movement of peoples in the region she discovered that around 1948, entire Jewish populations of surrounding Arab lands had been forced out and had gone to Israel and other countries in the world. However, there was no consideration of Jewish refugees by the rest of the world in the way Arab refugees were recognized and very little documentation about these “other Jewish “Middle East refugees. Why had it been necessary to amend this definition as it related to the Arab refugees? The two year presence was a contradiction of assumed historic facts. 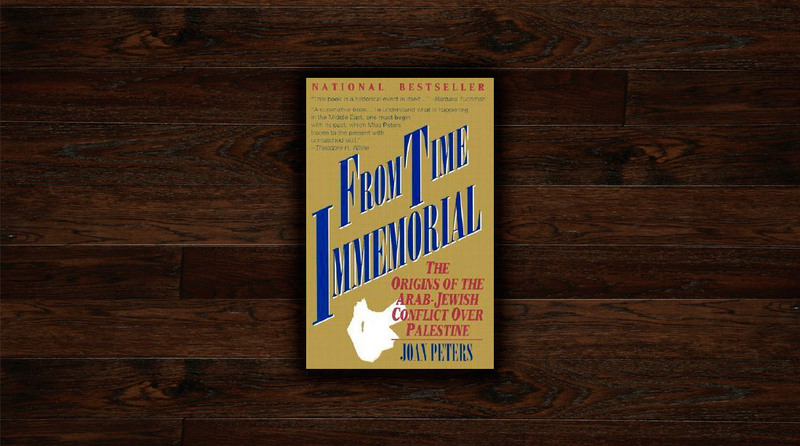 At this point, the direction and focus of Peters’ book began to change and she began to question the basic beliefs regarding the Arab – Jewish conflict. On the one hand the idea of destroying the nascent Jewish state following the Holocaust of WW2, was abhorrent. On the other hand, what was to be done with the four million Arab refugees, who had lived in the region “since time immemorial” and who were now “displaced” by the creation of Israel? The mainstream media and prevailing opinions espoused by the heads of European states, the UN, (UNRWA, the United Nations Relief and Works Agency was created solely to deal with \the refugee status of Arabs who were displaced, or left voluntarily, during the 1948 War of Independence), the USA and the Pope championed the “ legitimate rights of the Palestinians”. Assumptions about the Palestinian narrative had been made and repeated so often and for so long that they had been accepted as truth – Jews had lived peacefully with Arabs for many years before 1948; Zionists, living abroad had returned to take away properties of millions of expelled Palestinians; once the Palestinians had their own homeland, all other disputes could be settled. Thus, we have the creation and maintenance of the Palestinians as victims. During a visit to a refugee camp in Lebanon in 1974, Peters was shocked that these people were still living in camps as refugees even though 25 years had passed since Israel had been declared a state. No attempt had been made to rehabilitate or integrate them. This outcry for Palestinian statehood was echoed by Israeli voices as well, giving even more credence to the Palestinian narrative. For liberal humanitarians who believe in rights for all, the competing sets of claims by Israel and the Palestinians were confusing. Following the discovery in writings of Churchill and Roosevelt about the massive Arab immigration to Palestine, Peters changed the focus of her book and began to reflect on willingness of Arabs in the region to manipulate and use their fellow Arabs as a tool to further hostility and opposition to the existence of Israel. Peters conducted personal interviews in the Middle East, delved into archives at Oxford, London, the UN and US Library of Congress and found conflicting information regarding the movement and distribution of peoples in the Middle East region. She combined original research and narrative with relevant evidence from recognized authorities and primary documents. British, Arab, Turkish and other earlier authorities provided information on Arab and Palestinian past and present. Jewish and when available, Arab sources provided historical information on Jews in Arab countries. Part 1 of the book deals with the identification of all the refugees displaced by the creation of Israel and where they are today. It also discusses the Arab-born Jews who were expelled from Arab lands. Part 2 deals with the makeup of the early peoples of Palestine and the unrecognized factors affecting how the world views the Arab-Israeli conflict today. Part 3 illustrates how the traditions of population movement contributed to the maintenance of the present day Palestinian refugees.